The US Denver Mint: The World’s Most Prolific Mint had Humble Origins Indeed. The US Denver Mint was established after the discovery of Colorado gold in 1858. Even though the Mint was authorized by Washington DC in 1862, many decades passed before the first Denver coin was struck. Things have changed quite a bit since then. Today, the Denver Mint is the world’s top coining facility, producing more coins than anywhere else. Hit the "Saga of the US Mint Chapters" link at the upper right to choose other US Mint facilities to study. The headings directly below are units of the Denver Mint chapter. "Indian Tribes, Rebel Emissaries, and Bad White Men"
The Mint Today.... Still Going STRONG!! On July 9th, 1858, William G. Russell of Georgia struck gold near the confluence of Cherry Creek and the South Platte River, located at the foot of the Colorado Rocky Mountains, in what was then the western edge of the Kansas Territory. Others had found traces of Colorado gold in previous years, but it was Russell's discovery of high grade ore that triggered yet another great American gold rush. Prior to Russell's arrival, only one family had taken up permanent residence in the vicinity, but they were soon to have many neighbors! This Collier & Cleveland lithograph from 1859 depicts the confluence of Cherry Creek and the South Platte River. The infant communities of Auraria (left) and Denver City (right) are separated by Cherry Creek. Public domain image. Within a few short months, the lure of riches attracted hundreds of fortune seekers to the area. 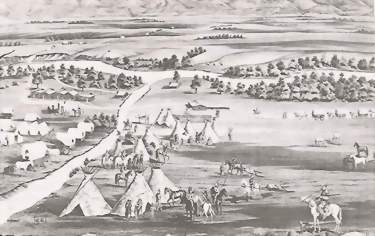 Two small rival towns were established on both sides of Cherry Creek; the encampment to the south was christened as Auraria (Latin word for gold), after William G. Russell's hometown in Georgia, and on the north side was Denver City, named in honor of James W. Denver, Governor of the Kansas Territory. Denver City was at first named St. Charles, but the town's founder, Charlie Nichols, lost his claim when he temporarily abandoned it. William Larimer of Leavenworth, Kansas resurveyed the area and hoped to score political points by renaming the town after the governor. By the close of 1858, the population of these two towns combined had reached 300, swelling to 4500 by 1860. Fearing competition from the community of Golden a few miles to the west, the leaders of Auraria and Denver City agreed to consolidate their towns into one, to be called Denver City. The union was celebrated by a nighttime parade on April 6, 1860, marching across the newly constructed Larimer Street Bridge that joined the former adversaries. In November 1861, the city of Denver was incorporated, about eight months after the Colorado Territory was formed. 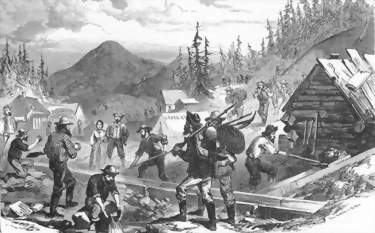 Colorado gold miners in 1859. One can see Pike's Peak in the background of this engraving. Public domain image. Just as Denver was ready to come into its own, larger amounts of gold were found in the mountains just west of the city. To the south, prosperous gold mines were opened in the shadow of Colorado's most famous landmark, Pike's Peak. At the height of the boom in 1859, at least 100,000 prospectors were toiling in the northern Colorado gold districts alone. Mining towns sprang up seemingly overnight, such as Central City, Idaho Springs, and Black Hawk. As was typical of rapid migrations of people into sparsely inhabited areas, the Colorado miners and merchants had very few coins or paper money to transact business. Gold dust was the primary medium of exchange. Of course, gold dust trading was, at best, a very imprecise procedure, ripe with fraudulent temptations. A photo of the Clark, Gruber & Co. building, taken around 1860. Who knows, perhaps the three men standing in front are the Clark brothers and Emanuel Gruber. Public domain image. Three resourceful businessmen, brothers Austin and Milton Clark, and Emanuel Gruber recognized the need for coinage to service the burgeoning population, and set out to capitalize upon the opportunity. In 1860, at a cost of $5000, they built a two-story brick building set upon a stone basement foundation, on the northwest corner of McGaa and and "G" Streets (today 16th and Market) in Denver City. Clark, Gruber & Co. quickly became a major purchaser of raw gold in the Auraria/Denver City locale. Paying anywhere from $12 to $16 in gold coins for an ounce of dust or nuggets, the fledgling enterprise then shipped the precious metal to U.S. mints back east for conversion into coinage. Even though the Treasury paid out over $20 in coins per ounce of gold received from the public, the venture proved to be less profitable than the Clark brothers and Gruber had anticipated, due largely to costly freight and insurance charges. It was at this point that they began to conceptualize setting up a private mint and coining the gold in Colorado themselves. 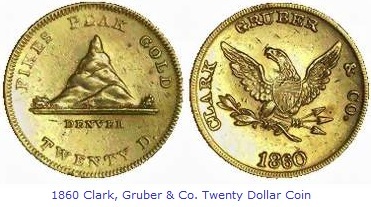 Pictured above is a $20 gold coin minted by Clark, Gruber & Co., in 1860. An unrealistic rendition of Pike's Peak, later replaced by another design, is shown on the obverse. It is estimated that only about 1000 of the private mint's coins survive to this day. Image courtesy of the American Numismatic Association. After wading through some legal research, the trio determined that a private mint was indeed legal. On July 5, 1860, the coin presses, dies, and other equipment needed to strike coins were declared operational. Later that month, the first Clark, Gruber, & Co. gold coins were struck and released to a coin-starved public. By October, 1860, the private mint had produced a total of $120,000 in gold coin denominations of $2.50, $5.00, $10.00, and $20.00. Sizeable gold coin quantities were also minted in 1861, to circulate alongside paper demand notes likewise produced by Clark, Gruber & Co. The opening salvos of the American Civil War were fired in April, 1861. In response to that great conflict, gold and silver coins, always considered a safe harbor in perilous times, were hoarded by an uncertain and fearful public. Moreover, government sponsored paper money was viewed dubiously. As the war raged, the Clark and Gruber Mint ceased coining operations, but continued to issue bank notes, redeemable at full value in gold coins minted by the firm in 1860-61. So while regions of the country closer to the Civil War battlefields were suffering a currency crises, at least in the Denver area, the monetary system was relatively stable. William Gilpin, the first governor of the Colorado Territory. Public domain image. Abraham Lincoln named William Gilpin as the first governor of the Colorado Territory. Upon arriving in Denver in May, 1861, Gilpin rapidly organized a territorial militia to defend the Colorado gold fields against a possible invasion from the Confederacy. 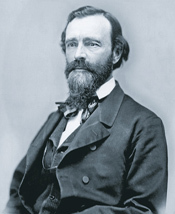 In the summer of 1861, Gilpin headed up a Republican Party convention held in Golden, where the local political powers declared their intention to push for a new U.S. branch mint in Denver. The Clark brothers and Gruber openly supported this proposal. The territorial delegate for Colorado, Hiram Bennet, then traveled to Washington DC, accompanied by Austin Clark. Members of Congress and Treasury officials were impressed by Bennet and Clark's pitch to establish a Denver mint. Several Clark and Gruber specimen coins were sent to Philadelphia for testing and analysis, where they received favorable reviews. 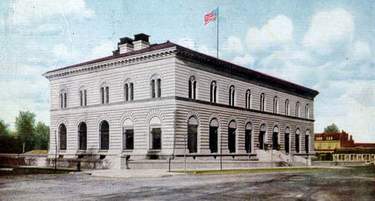 Treasury Secretary Salmon P. Chase then recommended that Congress authorize a branch mint in Denver, and that the building, equipment, and machinery of the Clark and Gruber Mint be purchased by the government to make the new branch productive as quickly as possible. Above is the Congressional bill, as voted upon in the Senate, authorizing the establishment of the Denver Mint, dated April 8, 1862. H.R. 287, 37th Cong. (1862). (View the page cited). Image courtesy of Library of Congress. On December 19, 1861, Bennet introduced a bill to create a US Mint in Denver. It was eventually passed by both houses of Congress, and on April 26, 1862, President Lincoln's signature was added to make it official: the Denver Mint was born! A commission was appointed to research the value of the Clark and Gruber Mint, but their efforts progressed slowly. 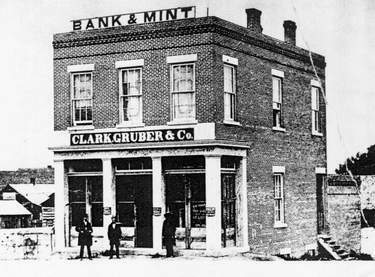 It was not until 1863 that the Clark, Gruber & Co. sold its minting operation to the federal government for a sum of $25,000. Immediately, the facility underwent extensive enlargement and remodeling. Finally, on September 24, 1863, the new "United States Mint and Assay Office at Denver" was ready for business. At the moment the new branch opened, no one could have believed that it would take another 43 years before the first coin of the Denver Mint was actually struck. 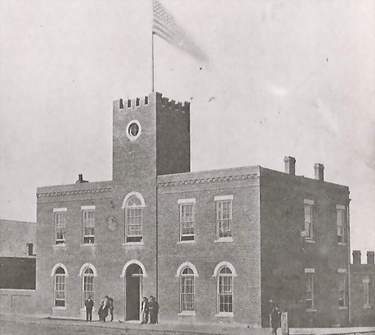 The first US Denver Mint, sometime during the 1860s. The original Clark, Gruber and Co. building was expanded and characterized by a new tower. In its days as a private mint, this building produced many coins, but as a US branch mint, not even a single coin was minted here. The structure was razed in 1909. Public domain image. The new Denver Mint took up residence inside the Clark, Gruber & Co. building as intended. Although the facility was equipped with assay and coining equipment, ultimately, no coins were ever struck there. Indian uprisings along the routes leading into and out of Denver convinced Congress to indefinitely postpone the start up of coining operations. Director of the Mint James Pollock cited "... the hostility of the Indian tribes along the routes, doubtless instigated by rebel emissaries (there being a Civil War) and bad white men...." as a primary cause of no Denver coinage. So despite being officially designated as a branch facility, the US Denver Mint was restricted to assaying and refining bullion brought in by miners and converting the raw product into bars stamped with a fineness rating, plus the words "U.S. Branch Mint, Denver." In the 1870s, silver was discovered near Leadville, returning prosperous times to Colorado. The heavy black sand cursed by miners for interfering in gold recovery efforts proved to be laden with silver, once someone got the idea to have it tested. Fantastic silver deposits were uncovered, eventually out producing the cumulative haul of Colorado gold, dollar for dollar. A Bird's Eye view of Denver, 1887. The confluence of Cherry Creek (bottom) and the South Platte River (top) is in the background. In the foreground, the state capitol. About half way between the capitol and Cherry Creek is where today's mint was built, beginning in 1899. Image courtesy of Geography and Map Division, Library of Congress. The Denver Mint was stuck in the assay mode for years. As law and order slowly gained a foothold in the American West, the city of Denver grew steadily in size, stature, and reputation, but still, no "thumbs up" from Washington to commence coining operations. As the years of inactivity stretched on into decades, nearly all those persons responsible for bringing the mint to Denver passed from this earth before seeing their dream of the "D" mintmark realized. The fulfillment of that vision would have to wait for the next generation. The new Mint undergoing construction, shortly after the turn of the 20th century. Image courtesy of the Denver Mint. 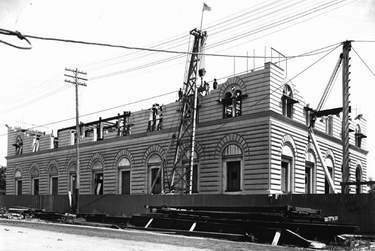 On February 20, 1895, Congress voted to authorize construction of a new, fully equipped facility for the Denver Mint. At long last, Denver was about to fulfill its mission as host for a US branch mint! The site for the new Mint building, on West Colfax Avenue between Cherokee and Delaware Streets, was purchased on April 22, 1896, for about $60,000 from the estate of former governor John Evans. Construction did not begin until July 1899. The Italian Renaissance style building was to measure 100 by 200 feet, occupy three stories, and consist of 100 rooms. The original appropriation of $500,000 was woefully inadequate, causing serious construction delays. 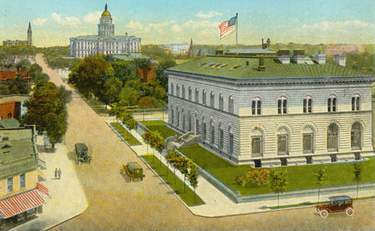 A postcard view of the Denver Mint, as it appeared when it was new, circa 1906. In 100 years, the exterior of the main building has changed very little. Public domain image. After a final spending tally of $800,000, the new Mint was finally ready for occupancy in 1904. All during this time, the old Clark, Gruber & Co. building continued to function in its familiar role as an assay office. After all Mint personnel moved to the new location on West Colfax, the decaying Clark and Gruber building was sold, and subsequently suffered the humiliation of housing a vegetable market. Mercifully, the structure was demolished in 1909. The Mint's new machinery was put on display at the St. Louis Exposition of 1904 before shipment to Denver and installation, causing further delays. Finally, the first Denver Mint coins were struck in February, 1906. The half eagle shown above was coined in 1906, the first year the Denver Mint was fully operational as a coining facility. Photo courtesy of Ira & Larry Goldberg Coins & Collectibles, Inc., Beverly Hills, CA. In its first year, the Denver Mint produced 167 million gold and silver coins, totaling $27 million face value, by far the most successful beginning of any US branch mint in history. After patiently sitting on the sidelines for so long, the Denver Mint quickly became one of the world's most prolific coining establishments. Another postcard view of the Denver Mint's early years, looking east up Colfax Avenue towards the state capitol. Public domain image. The early years of the Denver Mint's new home were indeed eventful. In 1920, a Mint employee, Orville Harrington, smuggled some $80,000 worth of pure gold (in the form of by-products of the coin manufacturing process called anodes). The treacherous employee was caught red-handed burying the stolen gold in his yard by a suspicious Secret Service agent who was trailing Harrington. 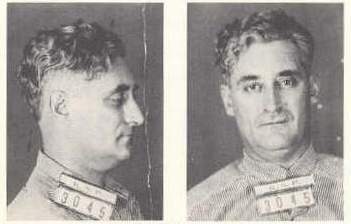 After receiving a sentence of 10 years in the slammer, Harrington was paroled after serving only three and a half years. A bloody exchange of gunfire highlighted another robbery at the Denver Mint a couple of years later. Coins from the Mint itself were not stolen, but rather paper money. The nearby undersized Federal Reserve Bank frequently utilized the Mint's vaults to store overflow currency. On the morning of December 18, 1922, a total of $200,000 in new five dollar bills was ready for transfer from the Mint to the Federal Reserve. Just as the bank's truck was loaded with the bundles of cash, a car pulled up and out jumped three men with guns blazing. A bank guard was mortally wounded before Mint security could return fire. Under a withering rain of bullets, one of the thieves grabbed the loot and hopped into the getaway car where he was joined by his companions. Harvey Bailey, one of the 1920s most notorious bank robbers, was implicated, but never formally charged, with plotting the Denver Mint Robbery. Bailey claimed his innocence, but the allegation dogged him to the grave. Public domain image. A massive dragnet ensued, but it took 18 days to find the bandit's shot up vehicle inside a rented Denver garage. Sitting in the front seat was the frozen body of one of the men, who apparently died of gunshot wounds inflicted during the robbery. The investigation linked the dead man to several gangsters who had been on a terrifying rampage throughout the central region of the nation. A portion of the money, $80,000, was later recovered in Minnesota. In 1925, federal agents announced that they had solved the crime, but released no details. In 1934, the Denver Police reported that five men and two women were identified as responsible for the robbery, and that all of them were either dead or already in prison on unrelated charges, but still no names were made public. Even though plenty of evidence suggests that other conspirators were involved, no one was ever charged with the crime. The great Denver Mint Robbery forever remains shrouded in mystery. 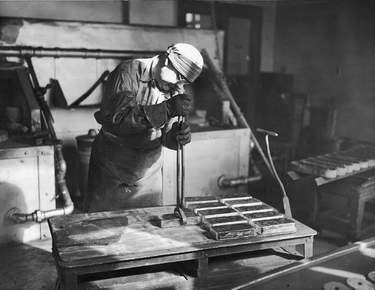 Taking new gold bars out of mold at the Denver Mint. Image courtesy of the Denver Mint. In 1934, the Denver Mint undertook a new role: that of a government gold bullion depository. Billions of dollars worth of gold were transferred from the San Francisco Mint to Denver, thought by many to be a more secure location because of its close proximity to the geographical center of the United States. More bullion shipments later arrived. In many instances, the gold received at the Denver Mint had to be melted and poured into stackable gold bars. Today, the Denver Mint houses the world's second largest gold bullion holding, exceeded only by the Federal Gold Repository at Fort Knox, KY. In 1936, a new 6000 square foot wing was built. At the same time, the old facility was renovated and modernized. As time passed, life in the Denver Mint became increasingly busy, and with that, the need for extra floor space intensified. Major expansions were added to the complex in 1945 and 1964. In 1996, a state-of-the-art die shop was built on Denver Mint property. Now, dies for United States coins are no longer exclusively fabricated at the Philadelphia Mint. 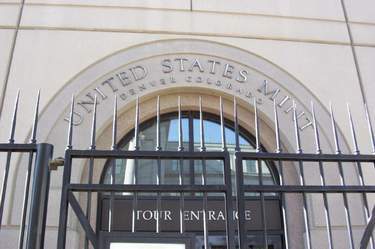 Public entrance to the Denver Mint. In the first years following the September 11, 2001 terrorist attacks, Mint tours were severely restricted. In April 2005, the Mint resumed same day walk-up tour reservations, on a first come-first serve basis. Image courtesy of Chance Brown. The heartbeat of the US Denver Mint today remains the 1904 building. While the exterior of the turn-of-the-century edifice has changed very little over time, the coining operation inside is world class, in terms of sheer production volumes. In the year 2013, the Denver Mint alone struck about 5.79 billion coins, a quantity that, believe it or not, is still well below its full manufacturing capacity. One of Denver's most popular destinations is the Mint. Visitors can best view this beautiful facility and learn of its history by taking one of the Mint's popular guided public tours. Reservations can be made online. See the artwork and marble of the Grand Hall, enjoy special exhibits and artifacts of the Mint's early years, and come face-to-face with the coin making process. It is also possible to obtain in-person tour passes through the Reservations Booth at the United States Mint Visitor Center located on Cherokee Street between 14 Avenue and Colfax Avenue in Denver. These are distributed on a first-come, first-serve basis. 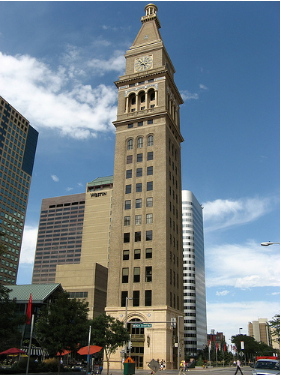 The dominant D&F Tower, built in 1910, is located only three blocks from where the first Denver Mint stood. Image courtesy of deejaycd1969 of flickr.com. Another top Denver tourist attraction is the 16th Street Mall. The pedestrian and transit way adventure stretching through the heart of the city's historic downtown district is characterized by beautiful tree-lined streets, quaint shops, and roaming musicians. The 16th Street and Market intersection where Denver's first mint, the Clark, Gruber & Co. building, stood a century ago, is situated toward the northwest end of this rejuvenated entertainment hub. The city of Denver is rightfully proud of its Mint. Tracing its humble origins back to the very earliest days of Colorado gold fever, the venerable institution has witnessed the transformation of tiny Auraria/Denver City into the mighty Rocky Mountain metropolis that it is today. Indeed, a good case can be given that it was the Mint itself that struck the foundation for the Denver success story. 2 Eitemiller, David J., Historic Tours: The Denver Mint. Frederic, CO: Jende-Hagan Corporation, 1983. 3 Helmers, Dow. "The Denver Mint Robbery, 1922." Denver Post, December 7, 1975. 4 United States Department of the Treasury.